They were super happy to go back... can you tell? Aiden said I was sending him back to the prison of death. Owen said summer had barely started and it shouldn't be school time already. Olivia just cried. Everything was wrong- her clothes were wrong, her hair was wrong, her shoes were wrong, nothing was going to be ok- nothing! It turned out relatively ok - they all had a pretty good first day. 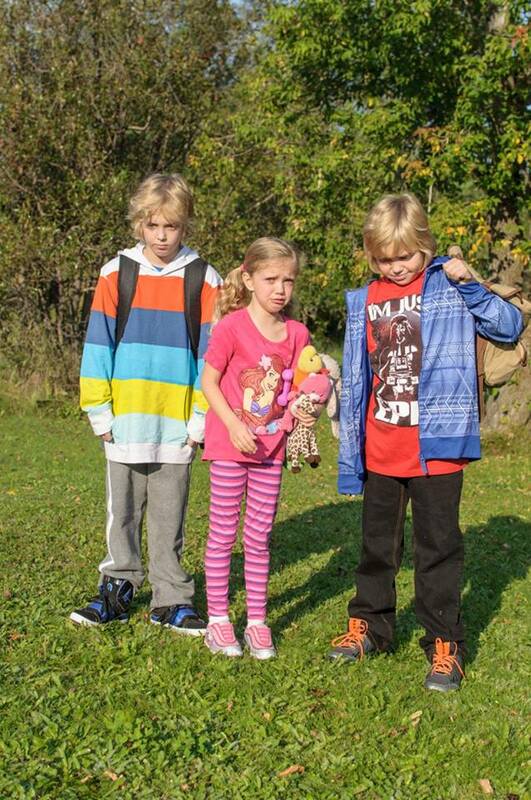 Aiden in grade 6, Owen in grade 5 and Olivia in grade 2. They all like their teachers. Aiden is not pleased about being in a 5/6 split class and hates that all of his friends are in the other class but he adores his aide so that makes up for almost everything else. Owen's class has no desks- only tables, couches and chairs and you are allowed to chew gum. Owen was extremely impressed by that. And the boys really loved their new shoes. SO you know- it wasn't all bad. Olivia is very sad that her best friends are not in her class and came out at the end of the day crying. She is still having a rough time but hopefully it will get better. She is usually the kid who loves school the most so I am hoping that once she feels a bit more settled things will turn around.